Discussion Why a true variant is not getting called by Haplotypecaller. I am using HaplotypeCaller for calling the variants for 120 gene based target sequence. For gene PMS2, there is a variant with coverage 21 (in that position) Allele fraction of the alternate allele is 5 reads ( 24%). The mapping quality of the reads are mostly 0 , I geuss because of the very similar pseudogene PMS2CL (mapping done with hg19 using BWA-MEM). 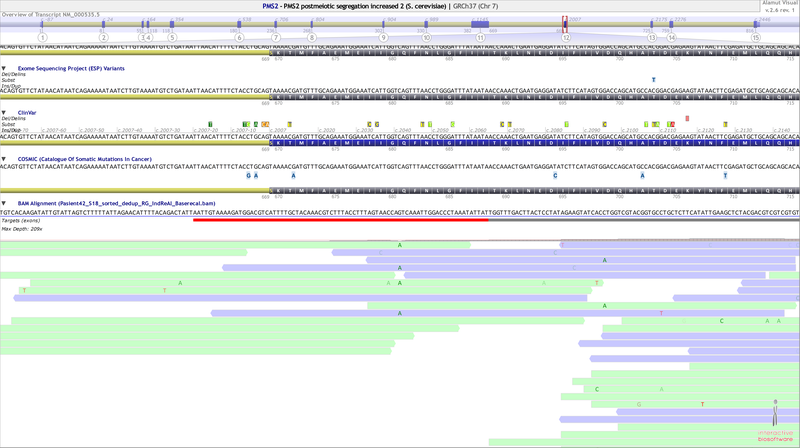 This variant is not getting called by haplotypecaller, but is actually a true variant (found with sanger sequencing). I compared the BAM file with bamout file, both are similar. I also tried mapping the sequence with custom reference sequence (target region based). when I used that bam file for variant calling, It called that specific variant (though it also increased the coverage depth and increased the number of variants many fold, which are false positives). I wonder what can be the possible explanation to this. what is the cutoff criteria, which haplotypecaller is using in this case? why the variant is not getting called at first place? HaplotypeCaller applies a mapping quality filter. The default value is set to 20, but you can change it. yes, that can be changed. but i wonder what is the minimum Allele fraction of the alternate allele is needed to be called as variant? There really is not a minimum allele fraction for an alternate allele to be called. There is a lot of Math in HaplotypeCaller that is used to call the alternate alleles. A basic rule of thumb is if two reads contain an alternate allele with a base quality of 40 or greater, the alternate allele should be called.